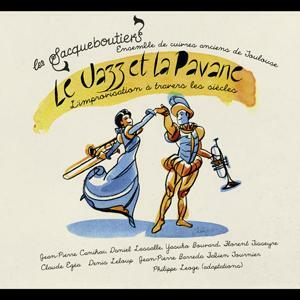 Le jazz dit "go men"
To paraphrase Claude Nougaro’s « Le Jazz et la Java » , « Le Jazz et la Pavane » reveals the happy marriage of two effervescent traditions, jazz and early music. Although belonging to ages long apart with much different aesthetics, these two movements have clearly the same musical identities. It is this aspect of improvisation of the ornamentation in the early music which brings it closer to jazz. Actually, 400 years have passed to find in the musical art again this liberty to leave it to the interpreter to express, starting with a proposed subject, his own emotion and his creative imagination. It is to express the similarities of these two musical styles that we have, in this recording, also chosen to show the complementarities of the used instruments. The two instrumental couples, ancient (cornet and sackbut) and modern (trumpet and trombone) are supported in the same way by a specific rhythm, organ/harpsichord, percussion on one hand, piano, bass, drums on the other.